All S-Cubed Tools uses field proven modules arranged in process driven configurations. In this way, S-Cubed equipment represents mature engineering design, while retaining maximum flexibility for customer processes. The Flexi series offers a polar coordinate robot, while the Scene series utilizes a cartesian plane robot with a polar robot capability. The principle difference permits far more addressable functions in Scene series while the Flexi can be both simpler and smaller. S-Cubed basics are fully automated, manually loaded process tools, ideal for academic and laboratory environments. Capable of processes including: Prime, Chill, Coat, Bake, PEB, WEE, Develop – with up to 50 wafers on the tool this work horse can do it all. For production photoresist processing of wafers to 200mm, with high speed handling and programmable wafer centering. A low footprint production photoresist with radial robot access and stacked modules for up to 200mm wafers. Our Wafer Edge Processing provides concentricity within .75mm, handling wafer sizes to 300mm, with flat following & patterns. 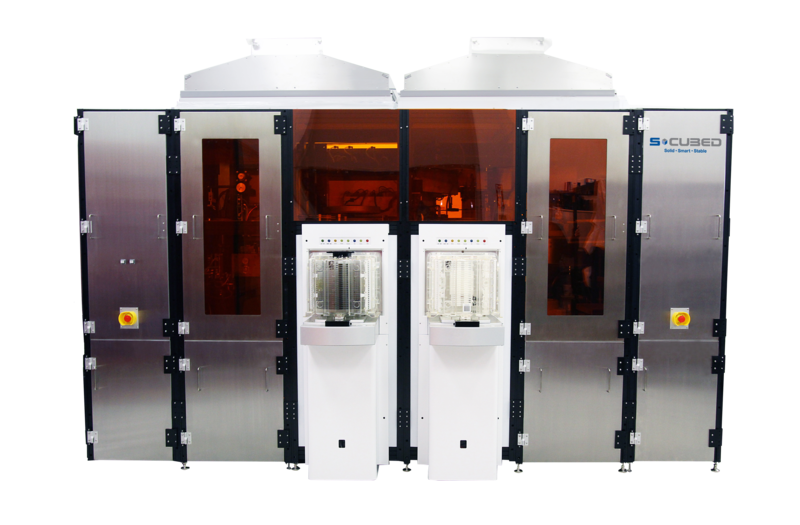 For your lab or research facility these value oriented machines replicate high cost lithography processesin smaller, less expensive footprints.